Escape to your own personal paradise at Vista Collina Resort’s expansive pool. Grab a refreshing cocktail made by our mixologist, indulge in wine country cuisine by Chef Vincent Lesage, or simply pass the time watching the sunset. 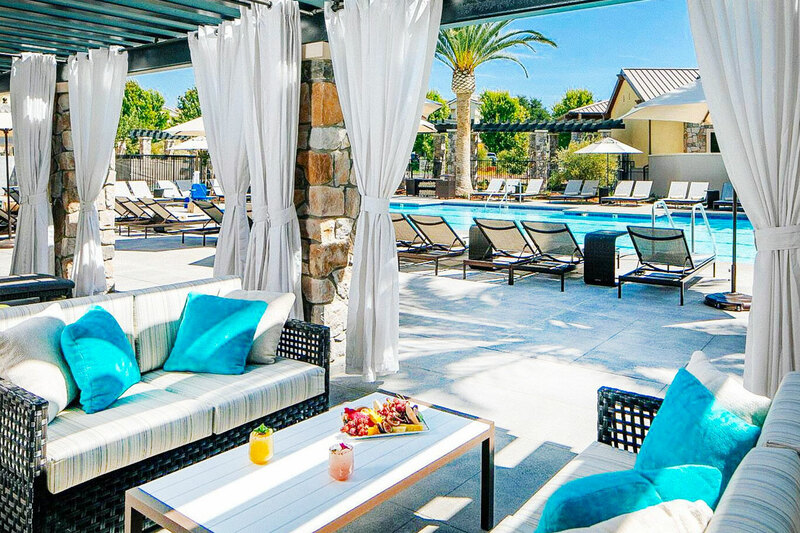 For a truly unforgettable experience, upgrade to one of our 10 luxury cabanas with personalized service and added extras for a leisurely afternoon in Napa. 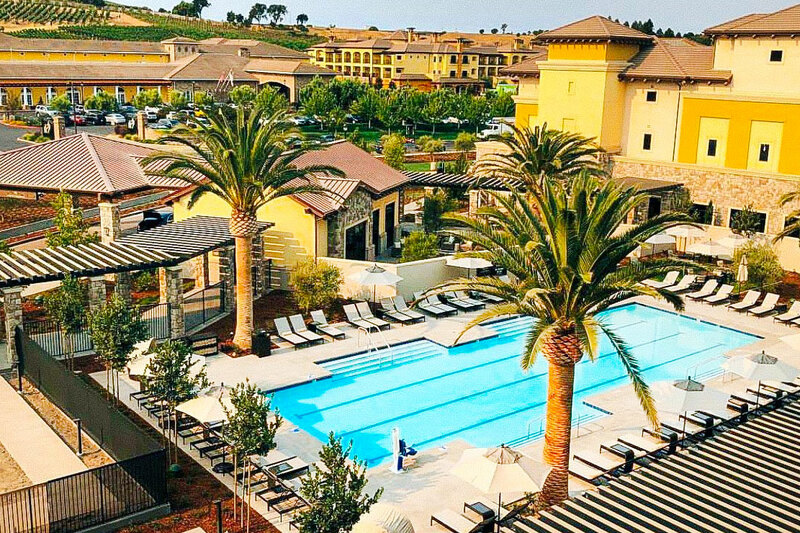 Your perfect Napa daycation is yours to discover at Vista Collina Resort! 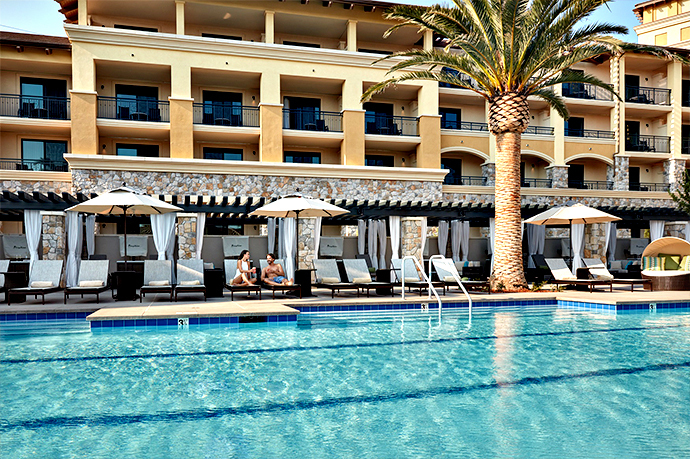 Cabanas can be cancelled by 10:00am PST on the day before your booking date. Day Passes and Spa Passes can be cancelled by 11:59pm PST on the night before your booked date. March 20, 2019 Ly L.
The personnel was so friendly and the property facilities were clean and beautiful. February 9, 2019 Anna M.
The pool was really nice but there were a lot of kids that unfortunately took away from the experience. The staff was attentive and wonderful. November 3, 2018 Sandy R.
While It was a very relaxing stay, we were hungry because the pool side service during the week is non existence. We had to go to front desk 3 times to ask for pool side service, just to find out that she was a from grocery store. Had we known, we would’ve just went to the grocery store and order ourselves. October 24, 2018 Heather H.
Lovely pool, great lounge chairs, professional and friendly service, and relatively peaceful atmosphere. Was great till we had a few kids who were given water guns by the hotel staff. Let’s not make the kids too comfortable that they kick everyone else out. But overall great experience. October 20, 2018 Mark J. Very nice resort with a gorgeous pool atmosphere. October 16, 2018 Melissa F.
We arrived around 10:30am on a Sunday. There weren’t very many people at the pool yet, so we had our pick of places to sunbathe. There were cabanas, lounge chairs and covered round cushioned chairs to choose from. Poolside service was prompt and friendly. The food was good and the drinks were very refreshing...The only downside was they stopped service around 3:00. Aside from that, a great resort to spend a daycation at. October 13, 2018 Jebidiah P.
Vista Collina was awesome! Super nice new pool and hotel added on to the méritage. Resort Pass is always easy, fun, and they’ll let you change or cancel your date if you can’t make it. Highly recommend! A great experience for a ladies' day out! October 7, 2018 anjali r.
Vista Collina was great! They have several wine tasting rooms and a brewery on site. The pool didn't get very crowded at all, so we probably didn't need the cabana we rented, though it was nice to have the option to be out of the sun for some periods of time. We'll definitely come back - probably to stay for the weekend. September 27, 2018 Leslie B. What a great way to escape the fog of SF! Nothing beats sitting by a gorgeous pool with great poolside service! This is my new favorite weekend outing. I can’t wait to go back. September 25, 2018 Ly L.
The staff service was good and it was a beautiful place.